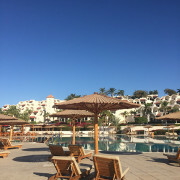 After just a week exploring the wonders of Egypt we headed over to Sharm El Sheikh for some relaxation at the Movenpick. 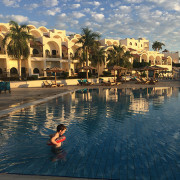 Over the last year, Movenpick Hotels have become my favourite hotel for family vacations, we have stayed with them in Jordan, Switzerland and now Egypt. 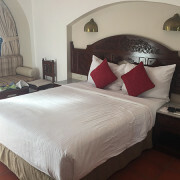 You will not find a comfier bed than one at Movenpick! 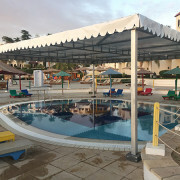 And it is not just the beds, there are so many more reasons why this is the best family hotel in Sharm el Sheikh. 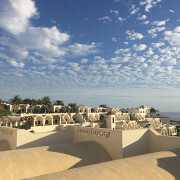 We were picked up at the airport in a Movenpick shuttle and brought to the family-friendly Naama Bay resort, which reminded me of a Mexican All-Inclusive resort and the beautiful white-washed hills of Santorini all rolled into one destination! 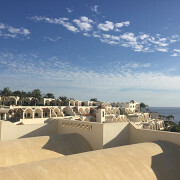 Sharm el Sheikh hotels dot the coast of the Red Sea, many calling it a concrete jungle, but for those like me who like a nice resort, it was a beautiful, relaxing paradise! 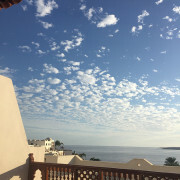 Perfect for a family holiday in Sharm el Sheikh! 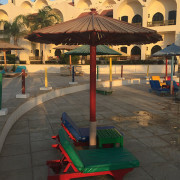 The Movenpick Sharm el Sheikh hotel has 5 beaches with chairs for sunbathing, snorkel gear for rent and an assortment of watersport activities from parasailing to banana boat rides. 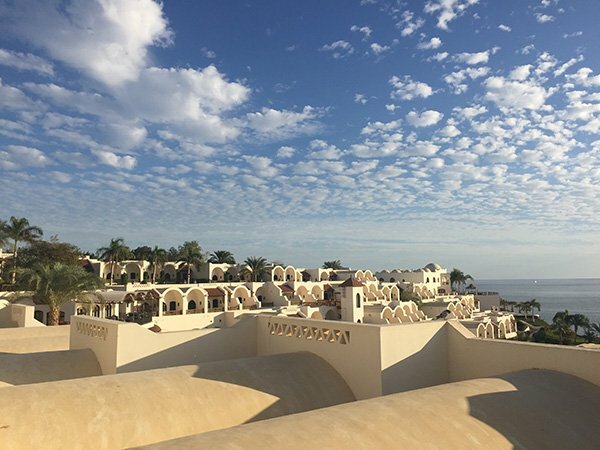 The resort has 302 rooms, all enjoying beautiful views of the bay and the pools below! 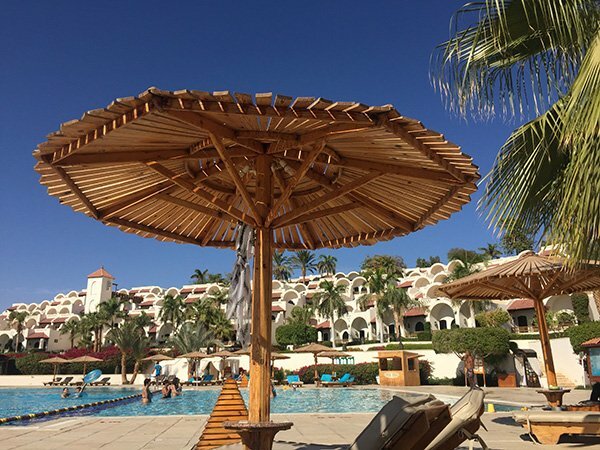 Why did we choose Movenpick Sharm el Sheikh over other resorts in Naama Bay? 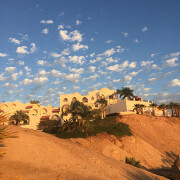 Besides my obvious liking of the hotel brand itself, there were a few things I was looking for during our Egypt vacation. First, I needed to relax. Travelling with kids can be exhausting. Do not let my photos tell you otherwise. I am not saying it is not amazing, but this mom needs some downtime. I wanted to be able to sit in a lawn chair for awhile and just watch them play! But even more than that, there was a Kids Club on site and the boys were SOOOOOO excited to head off each morning after breakfast. They even picked it over swimming in the pool! The Movenpick also had a horse stable and Markus is an avid animal lover. 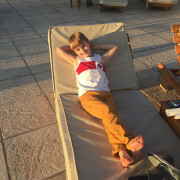 Give him a donkey, a horse, or anything else he can ride (except a camel, he has a severe dislike of camels thanks to his older brother”™s protests during our sunset camel ride in Wadi Rum), and this four-year-old is in heaven! Hearing that there was an equestrian centre on site was another huge plus for me. 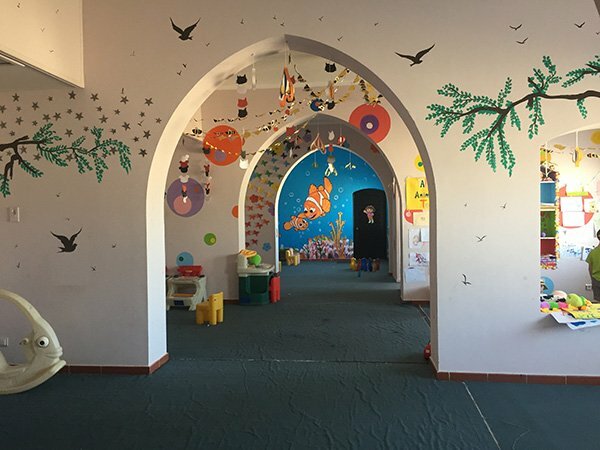 One of our first stops was to check out the centre and the staff were amazing! As they were getting the horses fed and watered, we were able to wander around the stable and meet the horses. We would be back the next afternoon for a ride along the beach! Who does not love riding horses on the beach! And these are not your typical 3rd world, bone sticking out horses. They were beautiful. I am an animal lover, and I also understand that animals are work animals around the world. I do not like to see them exploited. So before I agreed to ride a horse in Giza, I wanted to look at it. To me, they were skinny, but not malnourished. The horses I have been used to riding growing up are fat, so I took that into context. But the horses in Movenpick Sharm were well groomed and eager to run! 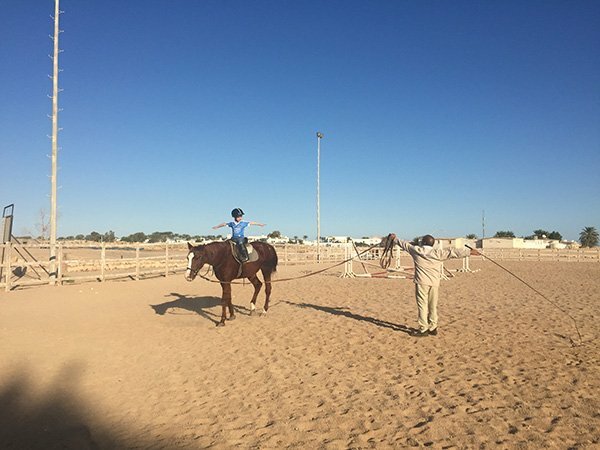 Markus even got lessons in the riding ring and had a great time! Now every holiday is going to have to involve an equestrian center! Markus hosing of “bullseye” (not his real name) after a walk in the sea! 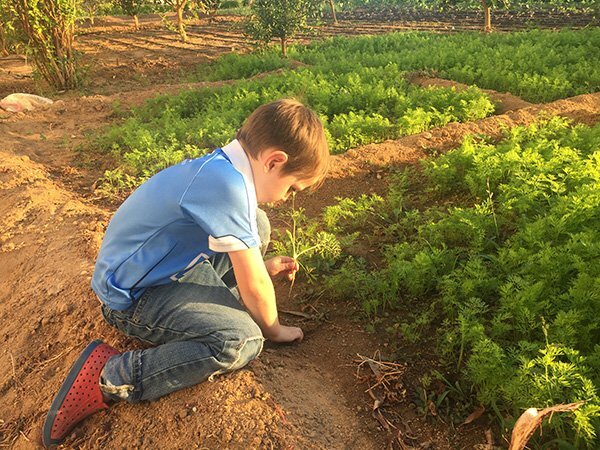 The Movenpick Sharm el Sheikh also has an organic garden located next to their tennis court. They had a green house and because of the warm climate they do not need grow lights like we have back home, just a good garden hose watering each day. 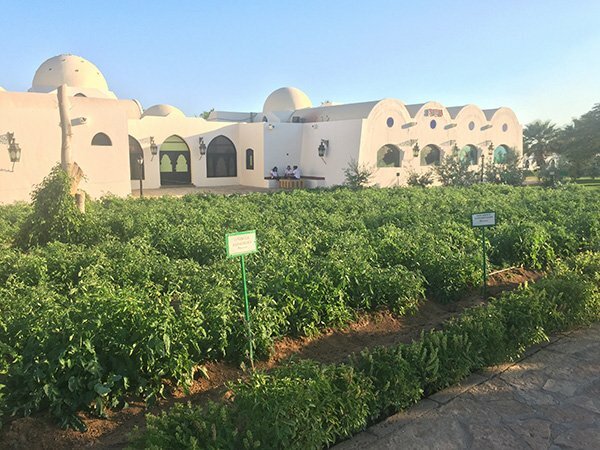 They also have guests plant olive trees after their 12th visit to the resort and it was really cool to see how quickly the trees grow in Egypt”™s Arid climate! 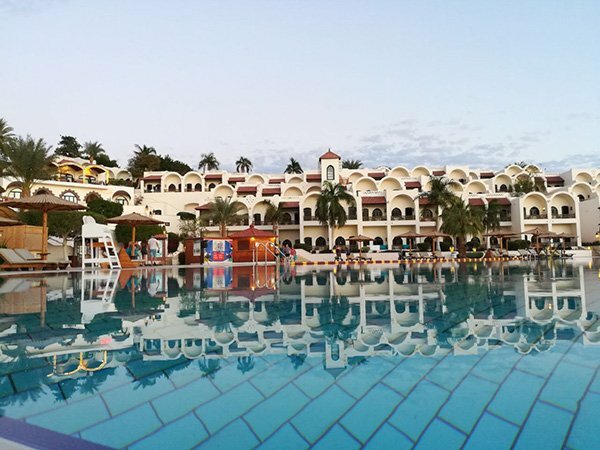 What else stands out for us about Movenpick Sharm el Sheikh? The food was excellent, as always! We enjoyed omelettes every mourning and ful, a dish of cooked fave beans. It is best when you add tomatoes and peppers and lots of lemon juice! 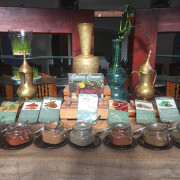 They also have buffet dinner option, as well as an Indian restaurant and an Arabic restaurant, El Kababgy. 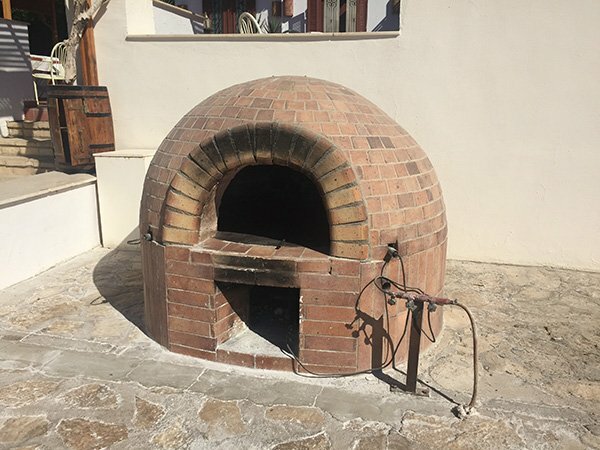 We enjoyed watching bread baked the traditional way outside the restaurant and the Mixed Grill was exactly what I needed. Mixed Grill is lamb cubes skewered and BBQed, kofta (minced lamb, like hamburger, grilled on a skewer) and grilled chicken. All cooked on a charcoal BBQ. The spices and flavours of the BBQ are what I love the most! My kids are big on meat, so mixed grill is the perfect meal (along with hummus and bread of course!) You can read the rest of the menu here. 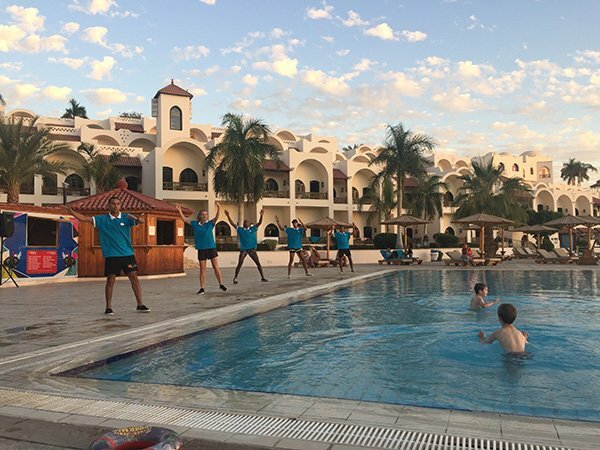 The kids would tell you their favourite part was probably the kids dance party each night as the staff did a great job of getting the kids all involved. 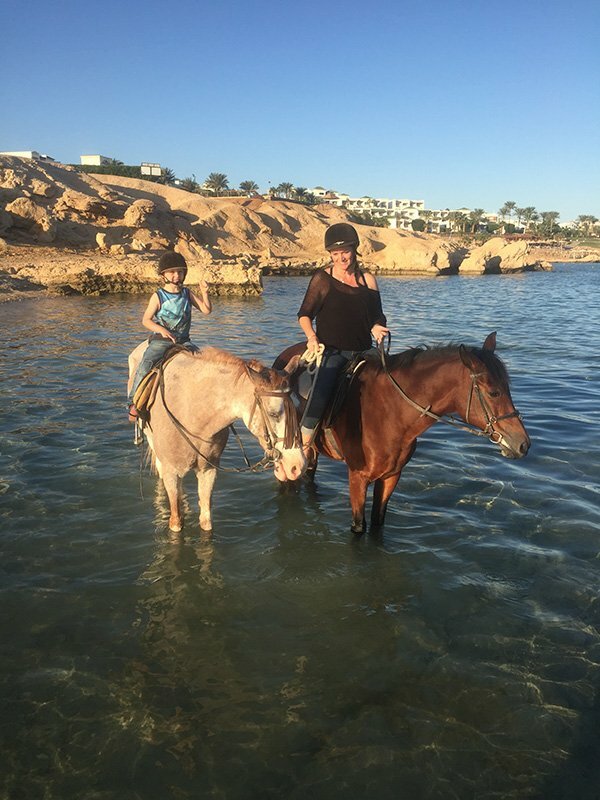 Markus might tell you he liked the horses better, but regardless of their favourite activity, whether it was the kids club, swimming, the ice cream bar, dance party or the horses, the Movenpick Sharm el Sheikh is a great place for a family vacation! The pool’s shallow end and the activities crew! Our Room was a one bedroom Junior suite. Essentially a double suite with the second room turned into a cozy living area. 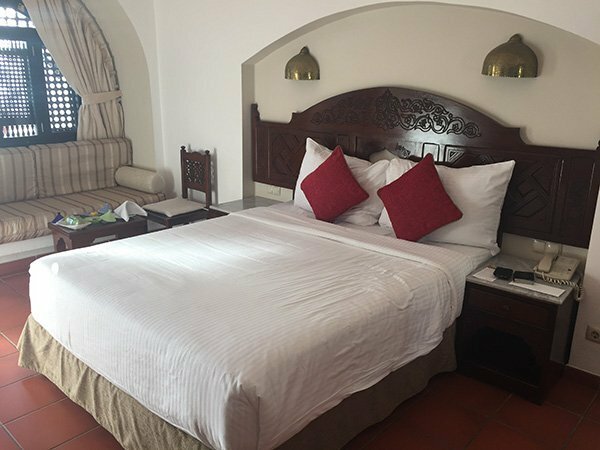 The housekeeping staff pulled the drapes for living room, brought in a bed, converted the window seating into a second bed and they boys had their own bedroom! It worked well because SPACE is a big MUST in our family travels! Our room had two bathrooms and two balconies. 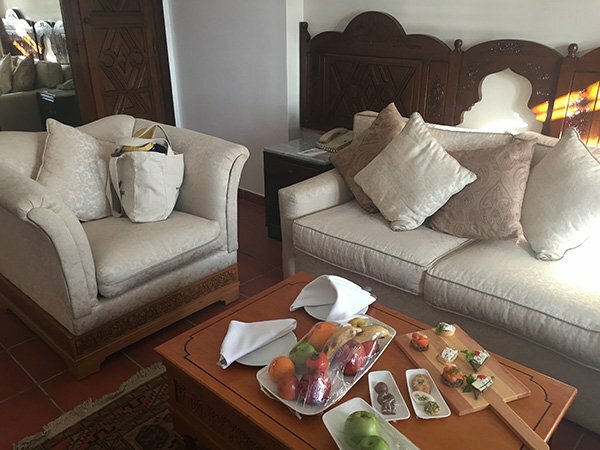 They also have family rooms which are two interconnecting rooms giving you plenty of space with your little ones! The usual Air conditioning, free wifi (but not fast enough for netflix) in-room safe, hairdryer, and TV were also in our room. 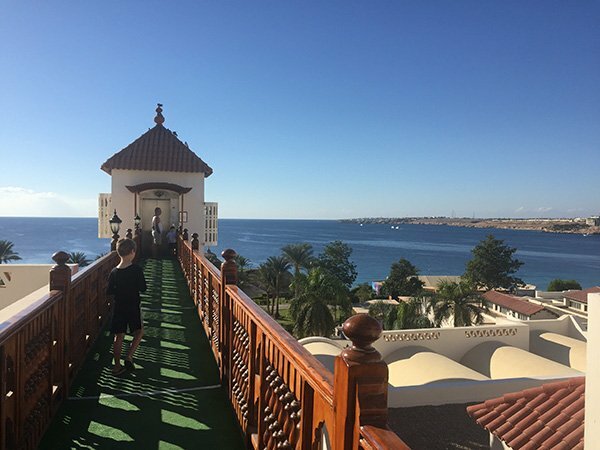 The balcony views were stunning, but with the hot Egyptian sun, even in late November, it was too hot to sit outside in the direct sun in mid-day and early afternoon. 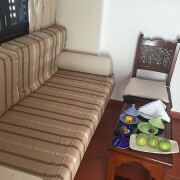 But we enjoyed morning coffee and looking at the evening lights from balcony! 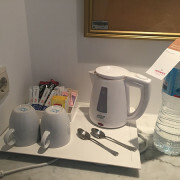 The room was equipped with a well stocked coffee bar and kettle as well as the usual bathroom necessities. The mini bar was also stocked and I caught markus on more than one occasion, trying to sneak a chocolate bar from the fridge! That is the hard part about mini-bars. 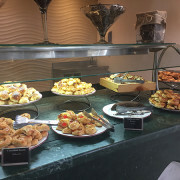 Sometimes, like in Movenpick Petra, the snacks in our room were free, and restocked daily. So the kids never know and always go for the snacks! But we love checking out grocery stores in other countries and usually have a bag of our own hanging around. 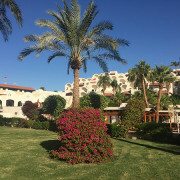 Movenpick Sharm el Sheikh Hotel also had classic rooms, deluxe rooms, other suite options and two floor villas accommodating up to 9 people in three bedrooms! Now those, I want to check out next time! I never felt unsafe in Egypt, security wise. Honestly, I felt most unsafe in airports and sea ports when I feared the hassle of security who wanted to be bribed. I carry nothing interesting (Jordan customs officials were very interested in the alabaster canopic jars that we bought during our Luxor tour and it took a good 20 minutes before they would let me take them out of the country. There was no way they were real Egyptian artifacts. Do I look that rich? But exporting artifacts from Jordan is illegal. Anyways I digress. That is another post); I have clothes (too many), toys, laptop, cameras (we picked up a new one for the boys so I also have too many cameras! Click this link for the Nikon we bought. ), phones, tablet, too many cords to plug in all of these electronics, a power bank (you can read our review here of the one we carry), a bunch of souvenirs, and toiletries. But hassle is what I expected, and ONLY at these types of security checkpoints did I feel unnerved. Security at Movenpick Sharm el Sheikh is typical for the area. The long driveway has cement blocks, forcing you to slow down and swerve left and right around them. This prevents and vehicle from driving up the driveway at 100 miles an hour. Taxis and busses need to slow to about 30 kmh to weave around them. You see these a lot at border crossings, airports etc. Our bus was scanned for explosives and a security guard checked underneath with a mirror. When we arrived by taxi, they had a quick look in the trunk and the taxi driver had to leave his ID with the security. Inside the hotel there is also security who quickly scan your luggage and they have a medal detector. 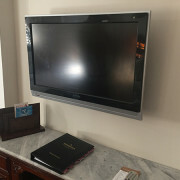 Almost all of the hotels in the Middle East that I have stayed at have the same thing. As do all of the tourist sites in Egypt. The boys love putting their luggage on the belt and the security usually let the boys look at the screen and see what their luggage looks like! Living so close to the United States, I am conditioned to an intimidating style security force. But it is nothing like that. These security guards are just doing their job and I have no problems with them there. When we walked out the back way of the resort to the side street, there was also security there who asked our room number when we left. Again, it is nice to know that you are being looked out for. What I did not see in Egypt that surprised me, was military clad security forces patrolling around. I have vivid memories of our France visit in 2012 of solders patrolling the Eiffel Tower grounds in quite the intimidating fashion. And again in July when we visited Paris, there was quite the security feeling there. 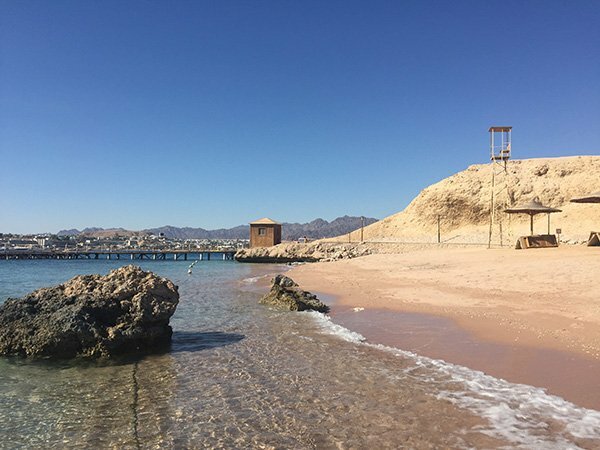 Overall, I felt totally safe in Sharm el Sheikh and it is no wonder why many tourists visit the beach town. Their tourism is still way down after a 2015 terrorist attack on a Russian plane, but Egypt as a whole is seeing a bit of a recover. I only hope that it continues and that more people chose to explore this wonderful country. You will see me back for sure, despite recent events in the country. If you want to check out rates for Movenpick Sharm el Sheikh, click here. I have to be honest with my reviews and it would not make sense to give you the full experience. But my misses are mostly insignificant as I did enjoy my stay very much. Firstly, the wifi. I was here to relax, but also to work. The wifi in the room was good enough for facebook, but not good enough for the kids to watch netflix or youtube. 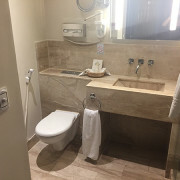 I assumed at other places we stayed in Luxor and Cairo that it was just bad wifi in our room and that was something I had read about in the reviews, but assumed Movenpick would be different. I had to sit in the lobby to be able to upload photos to my blog and even then, it was quite slow. Mattias could watch youtube in the early morning, but daytime and evening it was a no-go. No internet is not the end of the world, but when you expect it to be good and it is not, it is a bit of a letdown. The other miss at the Movenpick Sharm el Sheikh would be the amount of stairs. 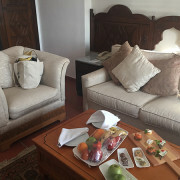 We had a beautiful room overlooking the pool and the Red Sea. But that meant that each time you went to your room, you had to go up stairs, a lot of stairs. And it was hot. YES THERE WAS AN ELEVATOR. and Yes, we used it a lot. Mostly when we had to go up, as it was one hotel section away from our block of rooms and going down the stairs was no problem. But if you do have mobility issues, this resort has quite a few stairs. And if you have a fear of heights, the walkway to the elevator will be a big problem for you. The last pet peeve that I should mention, is that I like a nice bathtub in a hotel. 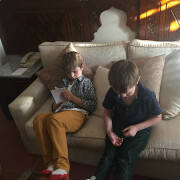 With kids, its makes it much easier (and it is a good time waster too, if I need 30 minutes to get some blogging done, a few toys and they are entertained). 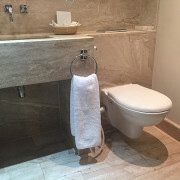 Our Junior Suite only had a shower. 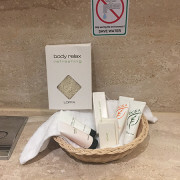 But it mentioned that in the hotel description, so I was not surprised. 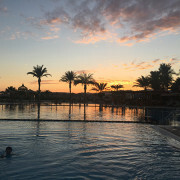 Sharm el Sheikh is a popular European tourist town, with many airlines flying direct from European cities, full of tourists looking for some sun and affordable luxury! Sharm el Sheilk International Airport is the third largest in the country and on arrival, is your typical airport. 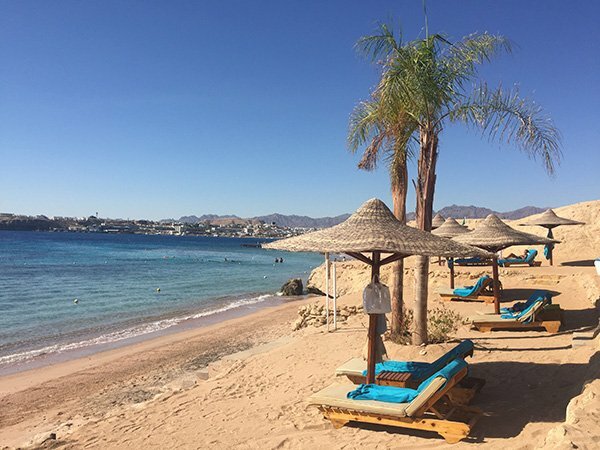 Sharm el Sheikh is… located on the southern tip of the Sinai Peninsula, along the Red Sea. It is a subtropical arid climate and enjoyed warm weather year round. 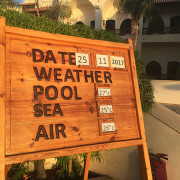 Rarely will the temperature dip below 18 degrees in the winter and summers you will see temperatures around 37 degrees. 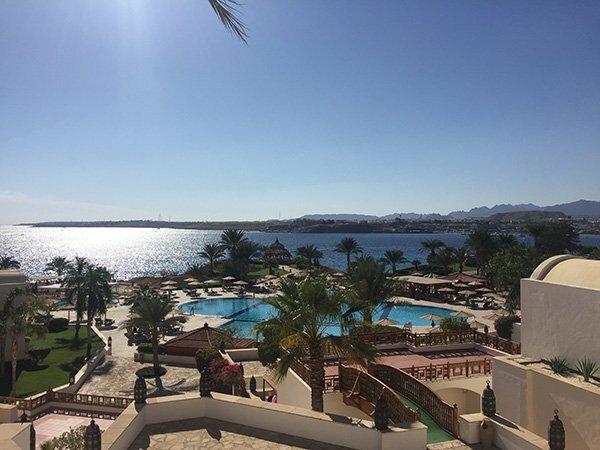 There is plenty to do in Sharm if you want to explore outside of the Movenpick. 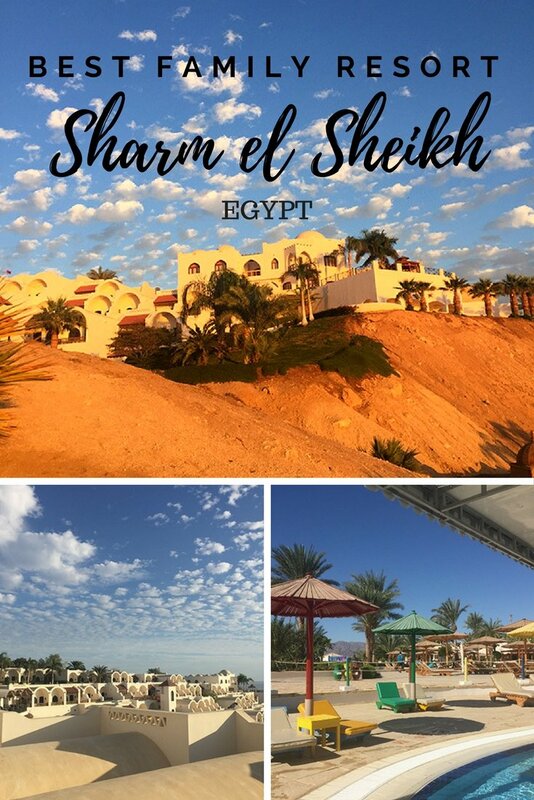 These family-friendly activities in Sharm el Sheikh are a great start: Quadding in the Desert (for kids over 6), Glass Bottom Boat Tour (all ages). 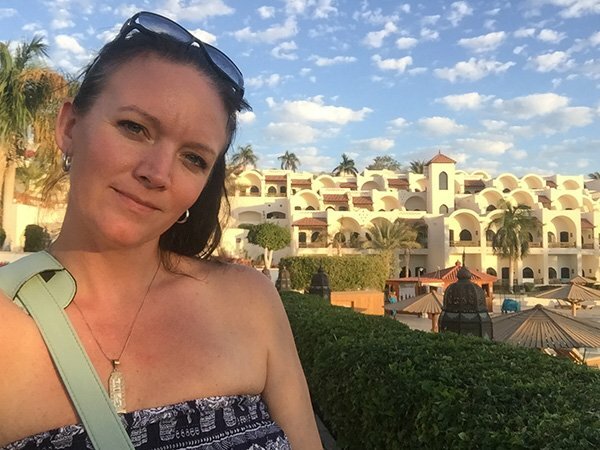 Have you been to Sharm el Sheikh? Where did you stay? Would love to hear about it!